When producing packs of sliced sausages or sausage-based snacks, sausage casings have to be peeled from sausages. Even when producers have installed high quality peelers it might happen that pieces of the sausage casing keep on the surface of the sausage. Due that most surfaces of sausages are quite heterogeneous it is hardly possible to detect remains of sausage casings. Because of many requests during our last exhibition we did some initial tests in our laboratory. For initial tests we used two types of salami from the supermarket. For the measurement setup we used a RedEye hyperspectral camera working in the wave length region from 1300 to 1540 nm provided by the German manufacturer inno-spec. 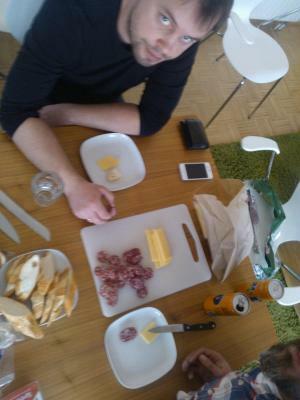 In the first test we peeled the salami and prepared it with pieces of the sausage casing. The sizes of the pieces were at the largest points between 5 and 10 mm. 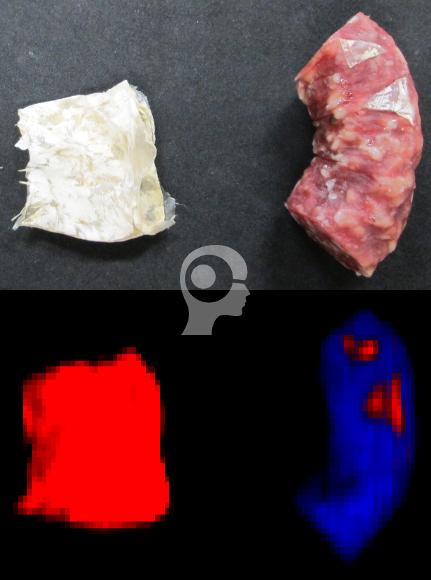 We have cut the sausage casing into triangle form to get a feeling if even very small remains could be detected. The sausage was scanned together with an empty piece of its casing. Spectra sets from the sausage casing and the peeled salami were selected. Choosing appropriate pre-processing and Perception methods lead to the Chemical Color Image above. It could be shown that with a proper setup even small remains of the sausage casing could be detected. By using industrial image processing tools, Chemical Color Imaging (CCI) streams are classified and monitoring solutions are realized. For the second test we have chosen another salami and compared it to its casing as well as to an unpeeled sausage. 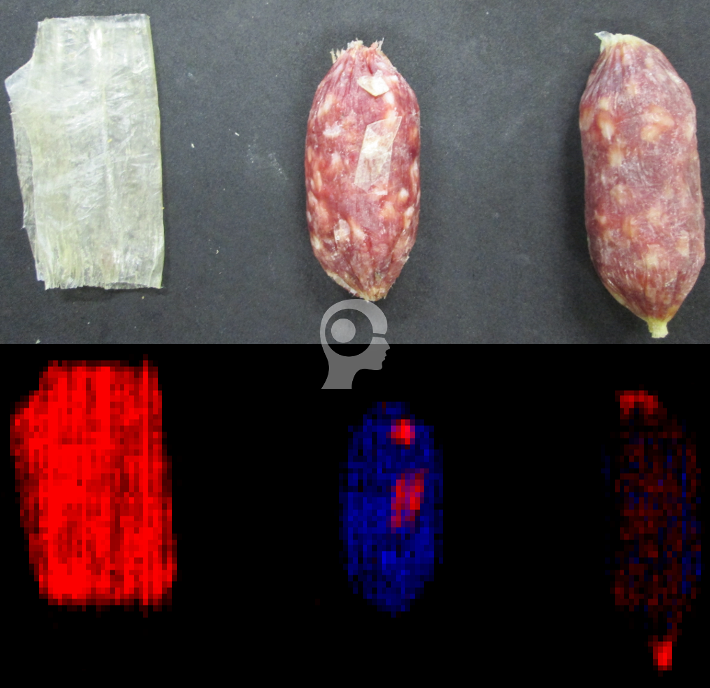 Also in this example the differentiation between casing, peeled sausage and sausage with casing could be shown. But in this example it can be seen that the differentiation is not that clear than in the first example. Reasons therefore might be the thickness or the type of material of the sausage casing. Here the strengths of Chemical Color Imaging (CCI) are well shown. When spectra consist of a mixture of different molecular properties (e.g. sausage and casing) it must result in a mixture of Chemical Colors as well. This can be seen on the right side in the Chemical Color Image above. Furthermore in this image it can be seen that also the thickness of a material e.g. the sausage casing have an influence on the color impression. This can be seen at the ends of the unpeeled sausage in the lower right of the image. Anyhow, by using common image processing tools these Chemical Color Images can be classified and hyperspectral imaging can be implemented into machine vision systems. Our tests have shown that the detection of remains of sausage casings is possible. We have also seen that the thickness of the casings will have an influence. On the packing of the sausages the material of the sausage casings was not declared. Therefore we cannot say if our tests are based on fibrous casings, collagen casings or natural casings but we don’t expect big differences in the solvability of applications. Perception Park is committed to the sustainable use of resources. Therefore our test materials were not just disposed but instead were repurposed to feed the team of Perception Park.